On June 20th, 2017, Mayor Miro Weinberger of Burlington, joined by Governor Phil Scott, members of the Vermont Mayors Coalition, and other community leaders launched a state-wide coalition – the Vermont Climate Pledge Coalition – to help achieve the December 2015 Paris Climate Agreement pledge by the United States and to mitigate the impact of the Federal government’s recent withdrawal from the Agreement. The Coalition leaders invite all Vermont municipalities, non-profits, colleges and universities, and businesses to join the Coalition and do all they can to help Vermont meet the U.S. commitment to reduce greenhouse gas emissions levels from 2005 by 26-28 percent by 2025. Vermonters are proud of their environmental stewardship as well as their Yankee frugalness—they take care of what they have so they can pass it along to their children. 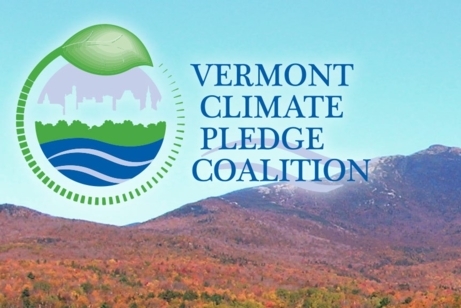 Joining the Vermont Climate Pledge Coalition is a way for businesses, farms, municipalities, non-profits, and institutions across the state to take part in each of these traditions. By adding your pledges and registering your actions through the Coalition, your organization will make a commitment to reduce your greenhouse gas emissions and save money on energy and equipment maintenance costs, and inspire other organizations across the state to make similar commitments. The Coalition will keep you accountable and on track to meet your goals and let members of your community know about the great work you’re doing to ensure a better future for all Vermonters. Outstanding Coalition members will also receive recognition by Coalition leaders to highlight your leadership in sustainability. Whether you’re an energy efficiency expert or just getting started, there is a place in the Coalition for you. By navigating to the Vermont Climate Pledge Coalition's Campaign page, you can draw inspiration from what others have done and browse through a list of 300 potential actions along with descriptions about their impact on your energy use and greenhouse gas emissions. If you want to add something you’ve done to reduce your emissions that’s not on the list, it’s easy to do so, and it’ll appear as an option for others in the future. If you’re not sure where to get started, the Coalition has identified some recommended actions you can take to get a better sense of your energy and emissions profile and what makes sense for you, such as scheduling an energy audit.